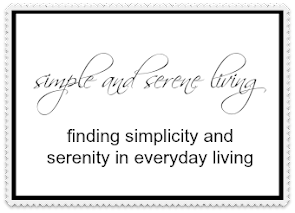 F Simple and Serene Living: are you fancy dancy? I grew up pretty fancy dancy. As a young girl my father was the head of a Canadian tobacco company and we lived a pretty fancy dancy life. There were lots of big parties with other fancy dancy people from around the world, and in high school, I was sent off to a fancy dancy boarding school. I grew up thinking I was supposed to live a fancy dancy life. But then there was the other side. While growing up fancy dancy, I was living in a small town and most of my friends were not fancy dancy people. They were wonderful average people living a simple small town life. So I started my adult life living fancy dancy. I opened a designer clothing store, my husband was a thoroughbred race horse trainer and I flew around in private planes and helicopters going from race track to race track, while all the while, inside was a simple small town girl. And then my world turned upside down. My husband became seriously mentally ill, and I was left to raise two daughters by myself. My fancy dancy lifestyle did not prepare me to live on my own. I have simplified all of the things that happened, but I learned some things from all of my experiences. I learned that girls need to be taught that they are capable of doing anything they want, and I taught my daughters that. I learned that it is important to love yourself. I learned that I am not really a fancy dancy girl. I am really a simple small town girl inside. I like the simple things in life: friends, family, thrifting, reading..... I don't ever aspire to be fancy dancy again. It's okay for some, but it's just not me. And while life can certainly be easier with lots of money and things, those things simply don't buy happiness. It is important to be secure and that is what I am working towards. This was kind of a difficult post to write. I wondered if I should just write down my thoughts and keep them to myself, but then I thought about how my blog is many things, and one of those things is sharing with my friends, because my friends are caring people who share with me, too. Life is definitely a journey and at any stage in life we can find our true inner self. It doesn't matter what other people think we should be or do. What matters is being ourselves. So, you will find this former fancy dancy girl out pickin' for vintage treasures, because that is who I am and what I love to do. See you at the auction, and don't be trying to outbid me, because I'll give you the evil eye. Wow! I didn't know you were once a fancy dancy girl! You seem so down to earth now. That must've been a great experience. It is part of who you are even today. That is sad to hear that your husband ended up mentally ill. I don't think there is enough awareness about mental illness because of the stigma associated with it. It is getting better though. It sounds like you've been doing alot of soul searching lately. I think you are one very brave and strong woman, who learned to adapt, and grow with the circumstances. My Mom grew up with maids, and servants in Holland, then they all moved to a farm in Alberta, no running water, no electricity, no cars...it's all about adapting. I like that you shared parts of your life, it's so interesting to find out more about our blogging friends. You are in a very good place, Laura. Keep going, brave girl! P.S. I'm not afraid of your evil eye! LOL I'd love to go to auction with you! When you use the words fancy dancy I think you mean wealthy. You are still wealthy with Joie de vivre, living a spirited cheerful enjoying life. That evil eye is a handy life tool you picked up with your other treasures. Happy Thursday, Laura. I have never had too much but always enough. Enjoyed your post. Another wonderful and inspiring post, Laura! Raising your daughters to live independent lives -- and teaching them by example the art of adapting when life throws you curve balls - is a greater gift than any fancy dancy finery. I never was fancy dancy, so I learned to make do and be resourceful at a young age. I know the devastating effect that mental illness can have on a family -- my mother was schizophrenic. It's a cruel disease. Thank you for sharing your beautiful life story and the lessons you've learned along the way. Your family is fortunate to have you in their lives. Blessings. Laura, I have goose bumps. What a beautiful heartfelt post. I am so glad you shared this with us. Makes you more "real" to me. Thank you for sharing this. Amazing what we really can do in life, when it just needs to be done. No fancy dancy here. I love simple things and living a simple life! Thank you for sharing your story. Hi, I'm a reader from Norway, and I was moved by your post. I have three small daughters myself, and I try to learn them that they can be anything they want. I was inspired by your story. I was so curious about the fancy life you led and the boarding school and the fancy parties, and then I got to the part about your husband. Wow. Life is full of hardships and blessings for each of us, isn't it? So glad you were able to share that reminder this morning. We should count our blessings no matter who we are or what kind of life we live. We are really all the same, aren't we? What a lovely post. That's EXACTLY how I felt when we moved out of London and into this little town, nestled in the country. I LOVE it! I suddenly felt as though I 'd 'found' who I really was all along- what an amazing feeling!! I sometimes feel myself slipping back towards my old ways but posts like yours remind of what I really value. Thank you! Great post Laura! Sometimes we have to see both sides of something before we know what we truly appreciate and value, you know? Interesting post with the fancy dancy. That's a very important statement you made---"girls need to be taught that they are capable of doing anything they want." A lot here to think about and so sorry about your husband. I'm very glad you stopped by my blog as it led me to yours. Keep up the good writing and take care. This is one of my favorite posts you have ever written. It came directly from the heart. And I understand. Because I am not fancy dancy either! Laura - Nice to know you!! I grew up in a family of four girls and a stay home Mother. So, when I look back, I realize that we didn't have alot of monetary things, but I didn't know it then. We had so much love and always had everything we needed. My Mom made have made my clothes, but I had plenty of clothes and always the new styles. It never bothered me that my clothes were home made. Now, I realize now how blessed my sisters and I were to have had parents who gave us love unconditionally. So not being fancy dancy isn't all bad.